With Final Fantasy XIV now fully reborn, it's time for the inevitable expansions. 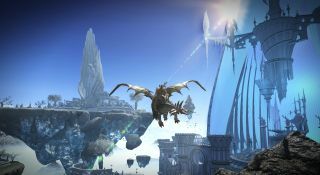 The first of these is rather clumsily entitled Heavensward, and adds flying mounts, new classes, and extra parts of the world. It also empretties (hey, I can make up words too) the MMO with new visual features, on account of it upgrading from DirectX 10 to DirectX 11. That's one better! You can see how one better it is in the above video, which also shows off those flying mounts, packs of armoured war chocobos, and some big old battles against snarling beasties and giant armies—and which generally makes a pretty strong case for Square Enix's MMORPG. Heavensward is out on the 23rd of June.